The Supreme Court today suggested formation of a three-member panel headed by former Punjab and Haryana Chief Justice Mukul Mudgal to probe charges of spot and match fixing in the Indian Premier League (IPL) cricket tournament. The Supreme Court suggestion is yet another setback to N Srinivasan. With power comes great responsibility — make it ‘great arrogance’, actually. That’s what seems to be the case with the BCCI, which clearly operates in complete disregard of public opinion, the other cricket boards or the ICC. In their quest to paint a rosy picture about the health of Indian cricket, BCCI President N Srinivasan and former treasurer Ravi Savant’s note in the Board’s Annual Report doesn’t have a single mention of IPL-VI spot-fixing scandal that rocked Indian cricket. With their focus on the No 1 spot up for grabs in the upcoming ODI series against India, Australian captain George Bailey and coach Steve Rixon said the visitors are no longer intimidated by the sub-continental conditions, courtesy the exposure they have got through the IPL. He has been the finest ambassador for India in the traditional form of the game and Rahul Dravid, after calling time on his cricket career, remained true to his first love — Test cricket. Throwing their weight behind an embattled Jwala Gutta, several former players have described the Badminton Association of India disciplinary committee’s recommendation of life ban on the star doubles player as “ridiculous and harsh”. Russia has installed an all-encompassing surveillance system at the site of next year`s Winter Olympic Games in Sochi that will allow security services to listen in on athletes and visitors, security analysts said on Monday. The Punjab Education Minister and president of the Punjab Kabaddi Association Sikander Singh Maluka has assured that Patiala will be one of the venues of the World Kabaddi Cup. A Bench comprising Justices AK Patnaik and JS Khehar sought the response of the Board of Control for Cricket in India (BCCI) and the Cricket Association of Bihar (CAB) to its proposal by tomorrow for passing an order on the issue. Additional Solicitor General N Nageshwar Rao and Assam Cricket Association member Nilay Dutta would be the other members of the proposed panel. 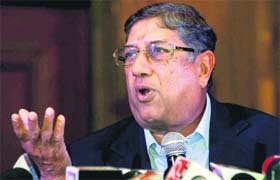 The Bench mooted the idea after rejecting BCCI’s plea for allowing the Board to form its own panel for the second time as the Bombay High Court had held on July 30 that its earlier committee, which had gone into the charges and given a clean chit to all concerned including BCCI President N Srinivasan's son-in-law Gurunath Meiyyappan, had been set up in violation of its own constitution. The Bench is hearing the appeals of BCCI and CAB against the HC verdict. While the BCCI has challenged the HC ruling that its panel was illegal, the CAB has come against the HC's refusal to constitute a fresh panel. The SC said the proposed panel would submit its report to the court, while the Mumbai police could go on with its investigations and file a separate case. CAB opposed BCCI's plea for letting the Board set up a fresh panel, contending that it would not serve any purpose as N Srinivasan's company, India Cements, owned IPL franchise Chennai Super Kings, whose team principal was Meiyyappan. Any such probe could not be fair as Srinivasan's son-in-law was facing allegations, CAB maintained. If a poll were to be undertaken across the world, the United States is likely to be voted the most divisive, even hated, country in the world. Despite being widely aped and despite its cultural influence all over the world, it is a country disliked for interference in other nations, and for forcing its opinion down the throats of the others. Yet, Rajeev Shukla, the former IPL chairman and the recently named vice-president of the BCCI, seems to take pride in likening the BCCI to the United States. “What the US is to the UN, the BCCI is to the International Cricket Council,” Shukla said in an interview. “The BCCI has earned its reputation and one should appreciate this, rather than criticise.” He's right on one point — the BCCI sure has earned its reputation. Shukla was asked about the censorious tone used by the Supreme Court about the workings of the BCCI. “If the apex court has made any observation, we shall look into it. Since the observation that has come is not elaborate, the BCCI lawyers are unable to respond," he said. "If the top court points out deficiencies, we will definitely correct them,” he said. Secretary Sanjay Patel’s two-page note has a passing mention of the spot-fixing and betting scandal involving big names like former international S Sreesanth and BCCI president’s tainted son-in law Gurunath Meiyappan. The Annual Report also doesn't mention IPL’s first Indian dope cheat Pradeep Sangwan’s name while it stated that “364 U-16 cricketers failed age verification tests.” The 128-page Annual Report of BCCI has the controversial Tamil Nadu strongman terming the year as “memorable and eventful for Indian cricket”. The president’s note only waxed eloquent about the achievements of the various cricket teams including the senior, 'A' team, U-19 and U-23. Srinivasan concluded his note stating, “IPL, in its sixth year, was a great success in terms of cricket content and attendance at all matches”. Patel, in his secretary's report, never used the word “spot fixing” anywhere. Instead, Patel wrote, “The BCCI responded strongly to crisis arising out of IPL-VI. The concerns have been addressed and continue to be dealt with and BCCI will do whatever is necessary to protect the game of cricket in India.” Only in Page 17 of the report, which contains the decisions of the Working Committee during the whole year, has a mention of a probe panel being formed to investigate into charges against Meiyappan. IPL sponsorship money received in IPL VI is Rs 180 crore compared to Rs 192 crore in IPL V.
Income from IPL-V's Play-Off matches is Rs 6.15 crore while income from IPL-VI's 'Play-Off' is Zero. Sale of ticket receipts from IPL-VI is Rs 13 crore compared to Rs 18 crore in IPL-V.
Advertisement expenses has gone up to Rs 31 crore in 2012-13 from Rs 11 crore in 2011-12. Gross IPL receipts from IPL VI was 892 crore compared to Rs 956 crore in IPL-V. Franchise consideration has gone down to Rs 460 crore in IPL-VI from Rs 613 crore during IPL-V.
Income from bank interest was Rs 102 crore during 2011-12 which came down to Rs 85 crore in 2012-13. The curent financial year 2013-14 has a budgeted surplus of Rs 389 crore. Umpire's and Player's Benevolent Fund was discontinued under recommendations from Working Committee. “If you look at the tournament, it is not just a tournament but a chance to be No 1 in one of the three formats,” said Rixon. “So, it is very important to the players, the coaching staff and Cricket Australia. At the end of the day, we want to sit back and want to be part of the No 1 side,” he added. If Australia win the series handsomely, they will go over India to become the world’s No.1 ranked ODI team and if the hosts win they will retain their top spot. Going into the intense contest against India, both Rixon and team captain George Bailey saw the advantage of having quite a few squad members with the Champions League Twenty20 exposure. Rixon, a part of the support staff of CSK as its fielding coach, agreed with his captain, adding the squad still had plenty of work to do to get the better of the ICC World Cup and Champions Trophy holders. “We still have got plenty of homework to do but the advantage as George rightfully said, we get to see them regularly now. We actually have more chance combating them,” he said. Rixon said the plus point for his team is that five of the players figured for their respective franchises in yesterday's CLT20 final between eventual winners and IPL champions Mumbai Indians and Rajasthan Royals. “Coming into a tournament like this, you need performance players. A lot of the Indian players, in fact all of the Indians, would have played in the previous tournament so that has got to be an advantage for everyone playing. “We have been fortunate to have five in the final, so to us, we are in a reasonable position as well. End result is, the guys who haven't been playing a lot of cricket, get them upto speed for the remaining, leading upto the T20 and the one-dayers. Once that happens, it's an even contest,” he said. “It was (emotional) in some ways. It's when you give up Test cricket, that's when you feel emotional,” Dravid said when asked whether he felt emotional turning up for Rajasthan Royals against Mumbai Indians in the last match of his professional career. “It was a privilege to lead such a bunch. The franchise has gone through a lots of ups and downs. It has been the same group and there was great working environment,” Dravid, who captained Rajasthan Royals to the final of Champions League T20, said. As he has done on many occasions, Dravid did mention that the spot-fixing scandal involving India international S Sreesanth was “very disappointing”. “It wasn't an ideal thing to have happened. I don't want to comment specifically but those were extremely challenging times,” Dravid told 'NDTV' in an interview. Dravid felt that the spot-fixing incident is a lesson for the cricket establishment that one needs to be “vigilant”. “It is very harsh decision. I think BAI could have dealt with it in a quieter way, without going to the press and defaming her ,” former national champion Arvind Bhat said. In a surprise decision, BAI disciplinary committee recommended a life ban on Jwala for trying to stop some players of her franchise, Krrish Delhi Smashers, from playing a match against Banga Beats in the Indian Badminton League. India’s top men’s doubles players K T Rupesh Kumar and Sanave Thomas, who played for Pune Pistons in IBL, also said it was ridiculous and will affect Indian badminton. “It is ridiculous. Life ban is too much. Whatever delay happened, only Jwala can’t suffer for that. It was kind of unfair what happened at the last moment. Anyone in her place would have reacted,” Rupesh said. The Badminton Association of India has appointed a three-member panel to look into the issue. Asking the panel to submit a report within a month, the BAI said Jwala will not be considered for selection till the reports comes. The three-member committee will issue a show-cause notice to Jwala, seeking her reply within a week," said BAI secretary Vijai Sinha. Panel comprises Anandeshwar Pandey, joint secretary IOA, Deepa Mehta, Luge Federation of India president and Swati Shukla, a former member of Commonwealth Games Organising Committee. The surveillance system was first developed by the Soviet-era KGB, predecessor of the FSB special services, in the mid-1980s and updated in recent years, said prominent security analyst Andrei Soldatov. Dubbed SORM, the system will give Russian security services free access to all phone and Internet communications at the Olympic Games in February without the providers` knowledge, according to research by Soldatov and his colleague Irina Borogan. Telecom providers are required to pay for the SORM equipment and its installation, but law enforcement agencies will be able to wiretap without having to show providers court orders allowing the eavesdropping, the analysts said. “Operators do not know what and when the FSB is monitoring,” Soldatov said. Citing research based on documents published by the Russian government procurement agency and other government records, the analysts said the authorities have been installing the surveillance devices in the Black Sea resort of Sochi since 2010. While the Punjab Sports Department had removed Patiala from the final list of venues for this year’s matches, Maluka said they will certainly be holding a match in Patiala but the venue for the match will be changed. Earlier, the Punjab Government had excluded Patiala, citing low footfall during the third edition of the World Cup as the reason behind the decision. Last year, following the last minute cancellation of the match between the Indian men’s team and Afghanistan on the inaugural day of the World Cup at YPS Stadium, Patiala, more than half of the viewers left the venue when the news spread. However, sources alleged that the decision was completely political. Patiala was being considered for the matches, but the Deputy Chief Minister Sukhbir Singh Badal asked them to change the venue since Patiala was a Congress stronghold. Maluka, who is also the Patiala district incharge of SAD, said during last year’s World Cup, the number of people coming to see the matches was less than in any other city and therefore they had not considered Patiala. He said YPS stadium usually is unable to draw much crowd because of its location. New Delhi: Govt Chawfianga Middle School, Mizoram edged out NCC (NER) by an injury-time goal to enter the final of the U-14 category of the 54th Subroto Cup. It was heartbreak for NCC right at the end as Ramfangliana (70+2) popped up seconds before the final whistle to punch in a cross. The winners will face-off with Betkuchi High School, Assam in the clash for the title. In the U-17 boys' event, Govt Model School, Chandigarh, thrashed Goa 10-0. Gurkirat and Anil scored a brace each. Indian School, Oman were handed a 2-0 defeat by St Stanlisus of Bihar. Among the girls, Ratanbala Devi scored four goals as RMSV Vidyalaya, Manipur, swamped Ahlcon Public School, Delhi 7-0. Sunita Devi, Hemolata Devi and Ranajans Chanu also found the net. New Delhi: Indian judokas rounded off their campaign with a couple of bronze medals in the IJF Grand Prix Judo Tournament in Tashkent. The medals were won by H Sunibala Devi and Th. Kapana Devi. Sunibala lost to Ivana Maranic of Croatia in the preliminary round but beat R Golmira of Uzbekistan in the second round. In the bronze medal fight, she defeated Anar Seitimoa of Kazakhstan.Earlier, Kapana had won bronze on October 4. Jammu: In the wake of the ceasefire violations by Pakistan and twin terror attacks in Samba and Kathua district, Jammu & Kashmir Indian Style Wrestling Association has for the first time decided not to invite grapplers from across the border for the 9th Mission Dosti International Indian Style Dangal. The Dangal will be held in Katra base camp on Oct 11.